Solomon Keal is a solo piano artist from Bryn Athyn, Pennsylvania. He composes peaceful solo piano music. His New Age, or Neo Classical, or Neo Romantic music reminds us of the folk piano style of George Winston. Solomon has four albums of solo piano music. 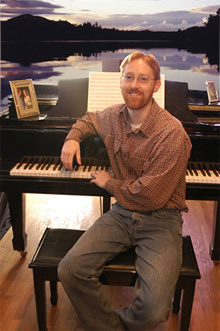 In 1998, with the extraordinary help of Clark Ferguson of Bearswamp Studios, and his family and friends, Solomon made his first self-published album entitled “Thoughts and Affections.” Then in 2000, he produced his second album, “Heritage.” In November of 2005 Solomon released a solo piano Christmas album entitled “Advent.” In November of 2006 he released his fourth album; a collection of his latest peaceful solo piano compositions entitled “Peace of Heaven.” He also released an album of love songs with his wife Tirah in 2009 entitled “Forever and Eternity.” There is also a digital-only album entitled “Bonus Tracks” released in 2010. And he is also working with his sister Roxanne, on composing several pieces for a flute and piano album. Click here to listen to a preview of this album. Solomon is an independent musician, and his music business is called Peace of Heaven Music. Six years of formal piano lessons laid the foundation for his ability to compose an average of 6 solo piano pieces a year since 1993. Solomon has performed his music for weddings, dinners, receptions, conferences, charity events, private parties, open mic nights, coffeeshops, and concerts. Solomon received a diploma in Recording Engineering from the Audio Institute of America, and is capable of recording his own albums, as well as recording for other musicians as well. In 2007 Solomon composed and recorded original music for a documentary about Glencairn Museum. Solomon’s music is featured on the famous online radio station: Whisperings Solo Piano Radio, and also on Pandora Radio. Solomon John Keal was born in 1977 near Philadelphia Pennsylvania, in a little town called Bryn Athyn. He spent most of his early childhood across the state in Pittsburgh. He was the first in a family of three kids who all grew up listening to, and loving music. His mom is a pianist; both of his parents play the guitar; and they all love to sing. Solomon started taking piano lessons in 1983, in first grade, from a lady named Polly Schoenberger. He didn’t enjoy taking lessons very much, and at the time he never would have guessed that he would eventually become a composer for the piano. In 1985 they moved back East to Kempton, Pennsylvania, which is near Allentown. There were no piano teachers available, so his mother taught Solomon and his sisters. When he was 12 years old, he stopped taking formal piano lessons. But, after about a year he found himself coming back to the piano again. His love for music never disappeared and he enjoyed trying to learn to play his favorite songs. He began to teach himself to play the piano by ear. It was a challenge that he still enjoys. He learned what made a song sound good. He learned the feel of music. In 1993, when Solomon was 16, he composed his first piano piece entitled: “Thunderstorm.” Since that time, he has written, on average, about 5 or 6 pieces a year. His years in college were by far the most fruitful for composition. The intellectual and artistic stimulation brought about a surge of creativity. The process of “coming of age” gave him a need to express himself, which he did most effectively through the piano. Solomon plays mostly solo piano. But, he has also co-written pieces for flute and piano (hear one) with his sister, Roxanne. Solomon is a songwriter as well, writing mostly Country and Christian songs (hear one), as well as co-writing love songs with his wife Tirah, for his most recent album “Forever and Eternity.” Recently he’s been teaching himself more about blues and jazz piano. His parents, Ian and Wellesley Keal, have been a large influence in Solomon’s musical background. His mother plays the piano and the guitar. She frequently plays for church services, and for many years she had her own small business as a piano teacher. It was through his mom that Solomon learned to love pianists like Scott Joplin, Hagood Hardy, David Lanz, and John Odhner. His father plays guitar, but his primary influence on Solomon was in the area of recorded music. Ian has excellent taste in everything from Classical to Rock. His dad was the one who introduced him to two music labels which greatly influenced Solomon: Windham Hill, and American Gramaphone. Specifically, the music of George Winston of Windham Hill, and Chip Davis of American Gramaphone. George Winston’s music especially inspired Solomon, and assured him of the simple and powerful beauty of solo piano. Film composers have also been a great source of inspiration for Solomon’s music, especially composers that use piano, such as James Horner. Solomon was named after King Solomon from the Bible. The name “Solomon” comes from the Hebrew name “Shlomo” which means “Peace,” or “Peaceful,” which is very appropriate for Solomon’s genre of music: Peaceful Solo Piano. Incidentally, the name “Solomon” is spelled with three O’s. It’s not “Soloman,” …although “Solo-man” could be an appropriate stage name for someone who plays Solo Piano. Solomon is married to Tirah Marie Echols Keal. “We met in college when we found we had the same astrological sign (Pisces) and started laughing at the horoscope page together when we read the newspaper in dining hall.” Long story short; they fell in love and were married on June 24th 2001. Their Wedding March, entitled “Angel’s Birth,” was composed by Solomon, and is featured on “Peace of Heaven,” and will also be featured on the up-coming flute and piano album. They have five children: Thea, Cirdan, Jaden, Zoe and Bram. They live in Bryn Athyn, which is a little town just north of Philadelphia, Pennsylvania. Solomon grew up in Kempton, Pennsylvania. He attended third grade through 10th grade at the Kempton New Church School. As a high school junior and senior he took part in a group homeschooling program called ASPIRE (Alternative Schooling Program Inspiring Real Education). He then attended four years of college at Bryn Athyn College of the New Church, and received an Interdisciplinary Bachelor of Arts degree in History and Religion. In 2005, Solomon successfully completed - with Honor Student Recognition - a course in Recording Engineering from the Audio Institute of America. Solomon is a part of the New Christian movement, sometimes known as The New Church, or Swedenborgian. Johnny “Appleseed” Chapman and Helen Keller were also members of this little-known but widely influential religion. “It is a Christian Church that believes in One Human God Who is knowable, personal, and loving. Who is in essence, Divine Love and Wisdom. This religion reminds us that the “Father,” “Son,” and “Holy Spirit” are not three persons, but three aspects of one Person Who is the Lord God Jesus Christ; much the same way each of us has a Soul, Body, and Mind. This religion teaches that God took on the natural human form of Jesus Christ in order to show us that we can have a personal relationship with Him, and to open the communication between heaven and earth so that we can be enlightened again. Jesus died and rose again for us, to show us how there are parts of us that need to die too, in order for us to be saved, and live in Heaven. This religion teaches that the Lord’s second coming happens for all of us when His Divine Truth is born again in our hearts, minds, and lives. It teaches about the eternity of Heaven and Hell, the eternity and importance of true marriage love between one man and one woman, and the importance of a life of useful service. The New Church focusses on the marriage of two elements that are too often separate in our lives. These two elements take on many names including: good and truth, faith and charity, will and understanding, thoughts and affections, love and wisdom, masculine and feminine, intellect and compassion. Neither of these two elements work properly on their own. When these two elements become married in our lives, then we are truly created in the image of God. The New Church is based on the Writings of Emanuel Swedenborg who was a servant of God - a revelator - who brought a new understanding of the Bible to the world. He explains that the whole Bible, like Jesus’ parables, has a deeper parable-like meaning to it. This deeper meaning explains the importance of the unity of faith and charity in life, and it assures anyone a place in Heaven if they believe in some form of God, and live a good life by their religion. This religion teaches tolerance towards the many different ways that a person can truly worship and praise the Lord. God is continually striving to bring every single person on earth into the eternal happiness of Heaven. Hell is simply the place people go if they choose to refuse the happiness of Heaven that the Lord is offering to them. We are spiritually free to choose good or evil, which is why we can be eternally happy in Heaven; because it is a conscious choice. This is also the reason why evil exists in this world; because we are free to choose it. God didn’t created evil, but He allows it to exist because He wants us to be free. This religion teaches a person how to change out of their bad habits and into a better, more useful and thoughtful person. This religion tells us that we are all intended to become angels in Heaven. It teaches a person how to turn away from selfishness, and turn towards loving the Lord and their neighbor as much as, or more than themselves. This is what it means to be “saved”, or to be “born again”. It’s a process, not a moment in time. What type of music do you compose? How do you compose a piece of music? Why do you compose music? What is your view of music theory? How did you record your albums? What information can you give me on the music business and how to get my music recorded? How do you learn music? Is there any sheet music of your recordings available?